A giant orange sun hung over the Western horizon as half the rally snatched the precious remnants of the fading daylight to erect their tents in the Gobi Desert. What of the other half? They are coming in, steadily, in dribs and drabs, shaken up but elated, like the rest of us, at the wonders of a remarkable day. Today was just over 300 kilometres of tough desert motoring down remote tracks, where for hours on end you don’t see another living soul, and where you can happily drive while praying you are going in the right direction with no sign of a rival competitor – he is on the far side of the hill, also hoping he has got the bearing correct, only for everyone to meet up here. A grassy slope that surrounded by empty grassy prairie…it could be a film-set from the Big Country, or, even Zulu, there is nothing here, at all, in any direction. The teams started with the hassle of the border crossing out of China, and then into Mongolia, but with the advantage of advance information on giant spread sheets prepared by the backroom workers of the Rally Office, it turns out to be a slick affair. 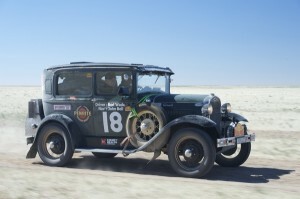 The teams are soon whisked through the formalities and immediately find themselves driving on sand and out into the remote desert with was just over 300 kilometres of tough desert motoring down remote tracks ahead of them. Cresting a hill, an old truck tyre that has been left baking in the sand for years, burns fiercely as a signal from the marshals, along with their giant roof-top chequered flag, that this is the start of the competition. Crews are set off at minute intervals. No regularity this, it’s the real thing – cover the distance, as best you can, till you find the finish of the first of today’s two Time Trials, it’s over 40 kilometres and takes them well beyond the horizon, with tracks spearing off left and right. 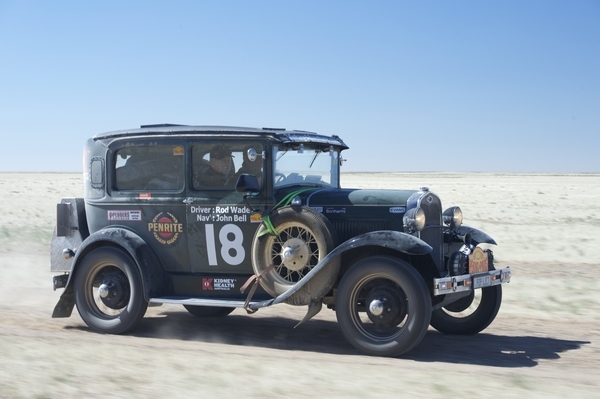 The route is so lonely, so remote that the day has mostly belonged to the drivers of the Peking to Paris Motor Challenge, where finding the way, and keeping the car together, has been the name of the game for most – while for some beating everyone else is paramount.